PageGate is an SMS messaging server application that sends SMS and text messages to: mobile phones, cell phones and other wireless devices. Messages can be sent a variety of different ways including: networked computers, e-mail, Internet web pages, commandline executables, text files, a serial port, and from within other applications. Messages can be sent to the telecom provider via: the Internet (SNPP, WCTP, SMTP), modems (TAP, UCP, GSM, TONE), or direct serial connections (TAP). PageGate is a high capacity software application, with built in redundancy and failover capabilities ensuring that urgent text messages are sent in a timely manner. NotePager Pro sends text or SMS messages to wireless devices, mobile phones, and cell phones using an easy to use desktop application. NotePager Pro sends SMS messages or text messages through an Internet connection, modem or a cellular modem. 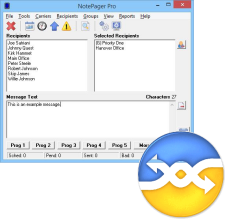 NotePager Pro supports group messaging, pre-programmed messages and scheduled messaging. Send SMS to anyone, anywhere, any time! 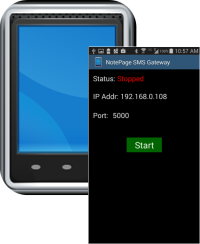 The NotePage Android SMS Gateway allows an Adroid phone to simulate a wireless modem. Wireless modems, are an excellent option for message delivery. Now any Android phone can be used as a wireless modem with PageGate and NotePager Pro. The Filter Pack allows for integrated communications and brings text messaging to a whole new level. Need a laugh? Checkout some text messaging cartoons and techie humor! Follow and like NotePage, Inc. on social media channels including: LinkedIn, Facebook and Twitter. Video tutorial steps customers through integrating SolarWinds Orion and PageGate to send network alerts to cell phones and wirleess devices. Video tutorial that walks visitors through the process of integration PRTG network monitoring software and PageGate to send alerts to mobile phones. The SMS and text messaging center includes interactive video tutorials, educational articles and support resources all pertinent to the sending of text and SMS messages. Video tutorials that walk users through setup and features in NotePager Pro and PageGate.